The Tiber Island is a river island in the centre of Rome. The island has a length of about 300 meters and is about 60 meters wide. The Tiber Island divides the river Tiber into about 2 equally wide halves. It is since the 1st century B.C. with 2 bridges, over each part of the Tiber a bridge. In former times it was a very important crossing over the Tiber, long time in the antiquity the only solid crossing over the river in Rome. Today the bridge to the city centre is a pedestrian bridge, over the other one you can drive by car. Among others the bridge is used by ambulances to the hospital „Ospedale Fatebenefratelli“ on the island. 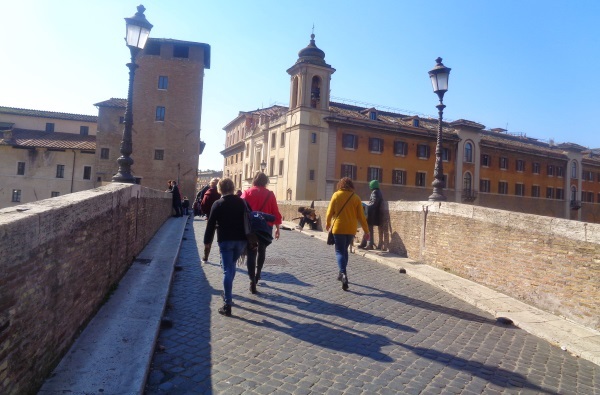 The bridge from the city centre to the Tiber island is called „Pons Fabricius“ and was opened in 62 BC. It has been preserved as a pedestrian walkway since antiquity (see picture below). The „Pons Cestius“ to the district Trastevere was also built for the first time in the 1st century B.C., but later rebuilt and widened several times. 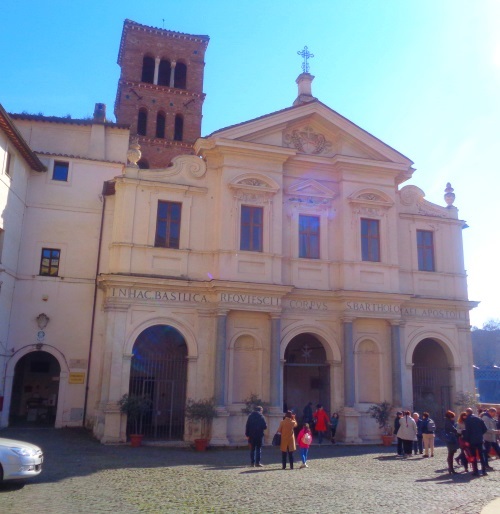 Today on the Tiber island (the island is also called Tiberina) are a well-known hospital, a church and a wide path around the island. In the beautiful old church „San Bartolomeo all’Isola“ there is an interesting exhibition about some martyrs from the 20th century, which was opened almost 20 years ago by Pope John Paul II. These include, for example, a conscientious objector from Austria who was executed during the Nazi era or a bishop from El Salvador who was murdered in 1980. On a staircase next to the bridge to Trastevere you can go down to the river. 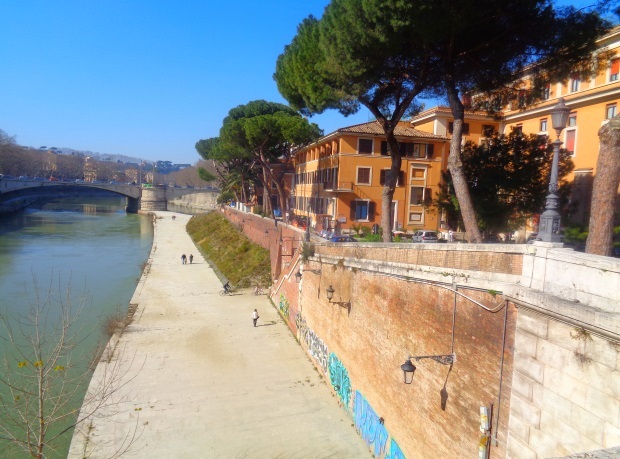 On a wide footpath (see picture below) you can walk once around the whole Tiber island (about 800 meters). In summer, the island in the Tiber is also a meeting place for young people from all over the world. Especially with children you should be careful. There is no fence or similar to the river. The Tiber is a dangerous river at this point with a steep gradient and strong current. In Italian the Tiber Island is called „Isola Tiberina“, in English simply „Tiber Island“. The next underground station is Circus Maximus, about 800 meters away. Nearby are the Capitoline Museums of Rome, the monument to Victor Emmanuel II and the ancient arena Circus Maximus. The Colosseum can also be reached on foot in 15 minutes from Tiber Island.